Here is a picture I took a few days ago of people wading and just hanging out in the Ohio River in Downtown Cincinnati. The people have jet skis with them. I’ve never seen anybody just standing in the river. I’ve always known it as polluted to some degree and as having snapping turtles dredging about. 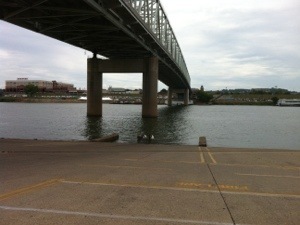 I don’t believe that folks should be standing in the Ohio River. 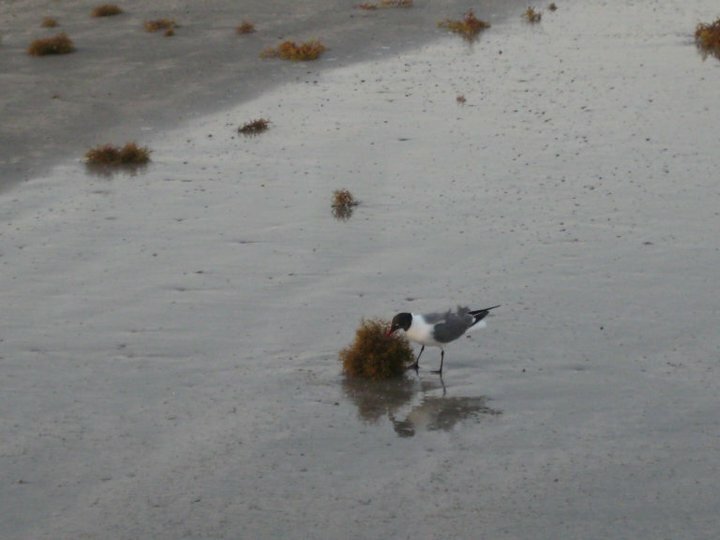 Above is a picture I took last year in Galveston, Texas You see that seagull is eating some creature unlucky enough to be caught in a clump of seaweed and washed up on the beach. This is what happens if you drift through life. You get washed up on the beach and maybe eaten. Any of various red, green, or brown algae that live in ocean waters. Some species of seaweed are free-floating, while others are attached to the ocean bottom. Seaweed range from the size of a pinhead to having large fronds (such as those of many kelps) that can be as much as 30.5 m (100 ft) in length. Certain species are used for food (such as nori) and fertilizer, and others are harvested for carrageenan and other substances used as thickening, stabilizing, emulsifying, or suspending agents in industrial, pharmaceutical, and food products. Seaweed is also a natural source of the element iodine, which is otherwise found only in very small amounts. Here is a link to the well-done Seaweed Site. It will teach you a lot about seaweed. Here is information from NOAA about deep water seaweed in the Gulf of Mexico. 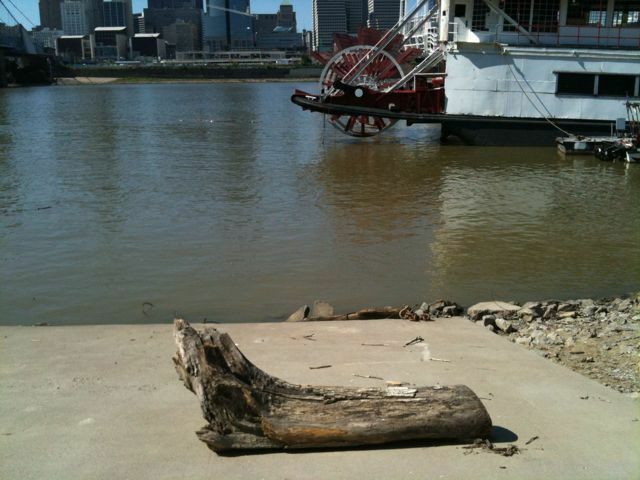 Below is a picture I took last year of some driftwood that got stuck on shore on the Kentucky side of the Ohio River across from Cincinnati. I don’t want to be driftwood. That log is marooned. At the end of this post is a photo I took few years ago of seaweed and what is, as far as I can tell, a sea tumbleweed. A tumbleweed just blows around. This picture was taken on the Gulf of Mexico side of North Padre Island National Seashore just outside of Corpus Christi. Circumstance plays a great part in life. Sometimes you are just out of luck. But to the extent possible, try to take command of your fate. Be more than seaweed, driftwood, or a tumbleweed. It is time to catch the flying flat boat for the return trip from Cincinnati to Houston. 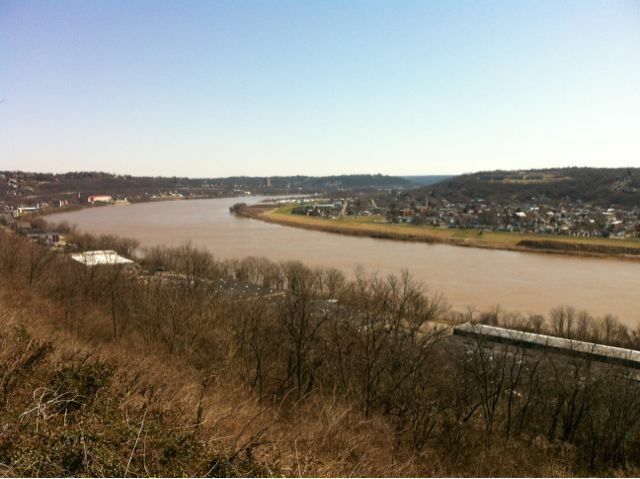 Picture is of Ohio River from Cincinnati’s Eden Park this afternoon. 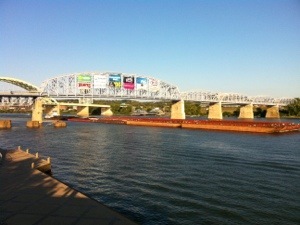 The sign above suggests that you might swim or fish in the Ohio River as it passes by the Riverside community in Cincinnati. 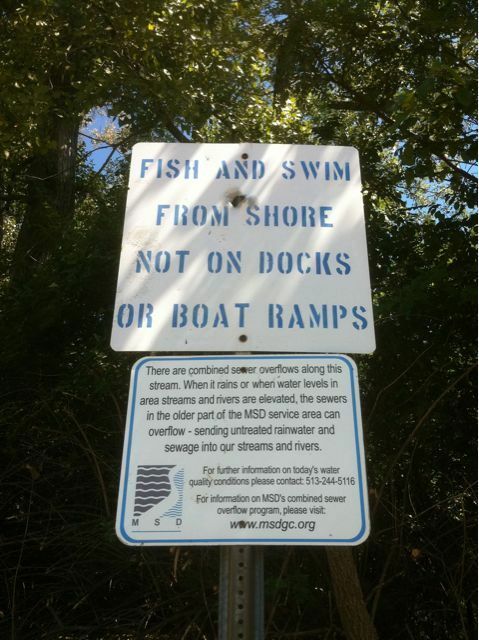 The sign below suggests that maybe you would not want to swim or fish at this place. 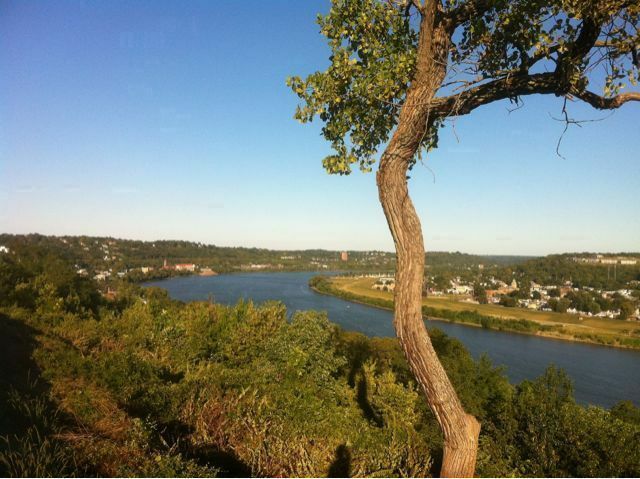 Here is a bend in the Ohio River as seen from Eden Park in Cincinnati, Ohio. I took this photo yesterday afternoon. Though I’ve lived up north for 30 of my 43 years, it’s interesting to be in a place where you can feel summer waning even if just to small degree. This feeling makes you value the day all the more. I’d also like to please note that this is post number 2,500 at Texas Liberal. Thanks to everybody who has read the blog. As I’ve been saying for the past few days–I’m a bit underwater. 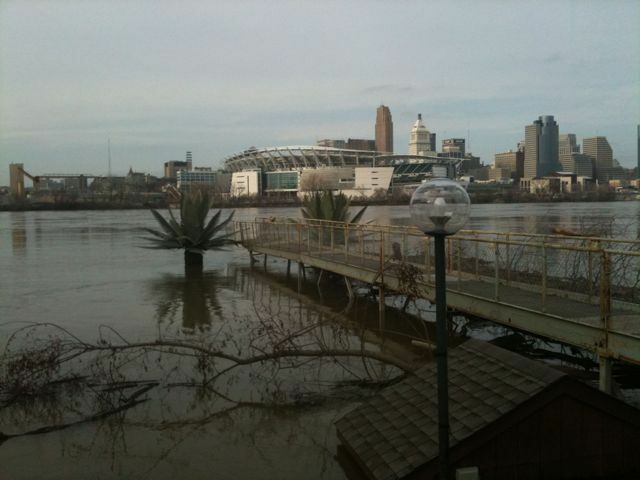 Picture is of the Ohio River at flood stage in Cincinnati, Ohio. I took this picture last March when I was in Cincinnati as my father was dying. There is very much to be hopeful about in our everyday lives. Everything we need to be hopeful and creative is around us if we apply effort and self-discipline to what we hope to accomplish. Stay the course no matter how strong the currents may be when the river is high. I was in the Cincinnati City Council Chamber when the council–by a 5-4 vote–approved the transfer of land that helped make the stadium deal possible. I’m glad to say that the councilmember I worked for at the time voted no. I’ve written about this matter from time-to-time over the years. I’m sure I will again. I’ll know I’ll not change anything about how the Bengals operate. Why should they change when they keep getting all the taxpayer dollars and don’t have to put a good team on the field? Yet still, I’m going to keep writing about this issue. The Galveston County Daily News reports that there is an unusual amount of seaweed washing up on Galveston beaches. Above is a picture I took last week in Galveston. You see that seagull is eating some creature unlucky enough to be caught in a clump of seaweed and washed up on the beach. Below is a photo I took few years ago of seaweed and what is, as far as I can see, a sea-tumbleweed. Circumstance plays a great part in life. Sometimes you are just out of luck. But to the extent possible, you’ve got to take command of your fate. Be more than seaweed, driftwood, or a tumbleweed. Sometimes you’ve got to turn around. 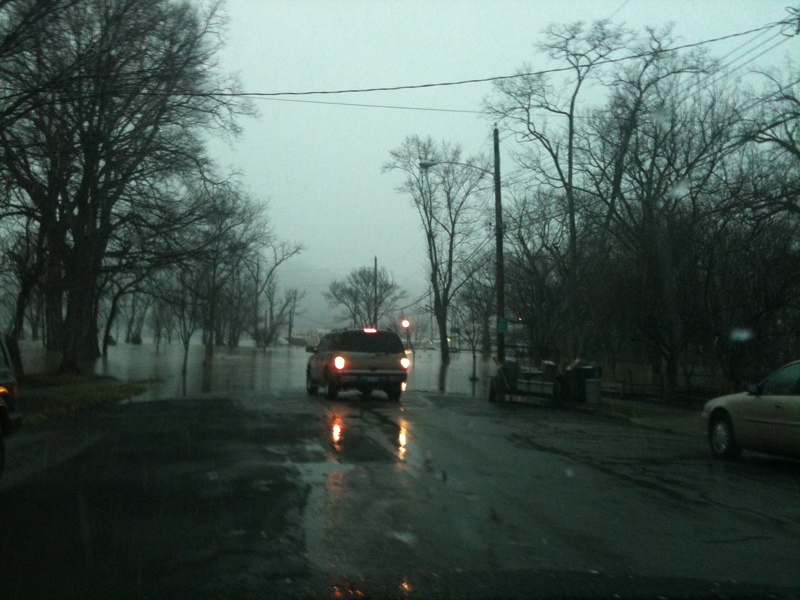 Picture of SUV at the edge of a flooding Ohio River in Cincinnati earlier this month. I’m feeling a bit inundated with the need to catch up with personal correspondence and with the need to nail down some ideas for future blog posts and other projects I’m working on. I’ve still not caught up with life after two weeks away in Ohio to deal with family concerns. So please excuse the brevity of this post and the absence of links. 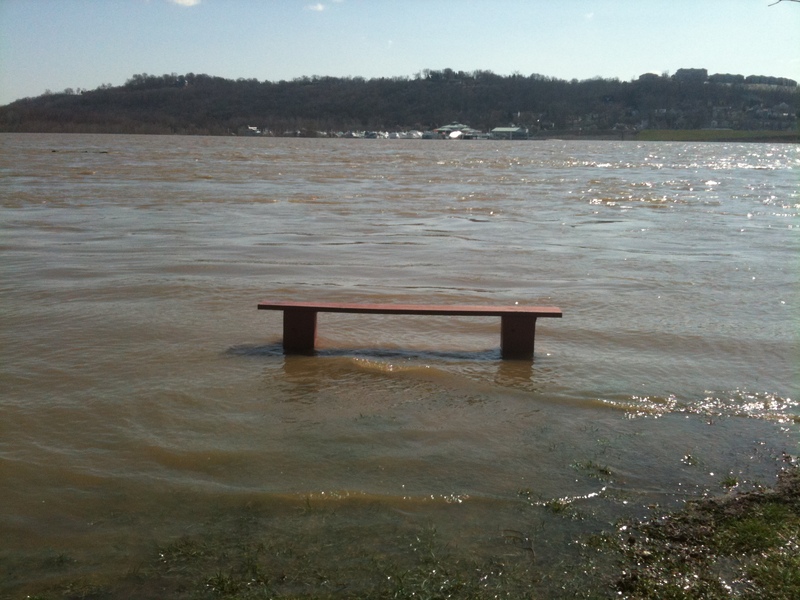 The picture is one I took earlier this month of the flooding Ohio River in Cincinnati. As you see for yourself, the picture suggests the concept of feeling inundated. The good thing is that most often the flood recedes. Understanding that the river is flooded might be seen as a value of the political left in that we are understanding the role of circumstance. What can we do about the fact that the river is flooded? Taking action to catch up on things I need to do to despite the adverse circumstance of the flooding river, might be seen by a few as a value of the political right. I’m moving ahead despite temporarily frustrating circumstances. My view is that the values of the political left involve both seeing the world as it is, and responding in the most hopeful way you can find. We are wrong to cede to the political right taken as a whole any virtue at all. Individuals of all beliefs may have many virtues, but in these times of right-wing extremism in the United States, we must indeed focus on self-reliance as we seek to move forward. There is always something we can do to move forward. This post did not end up being so brief after all. 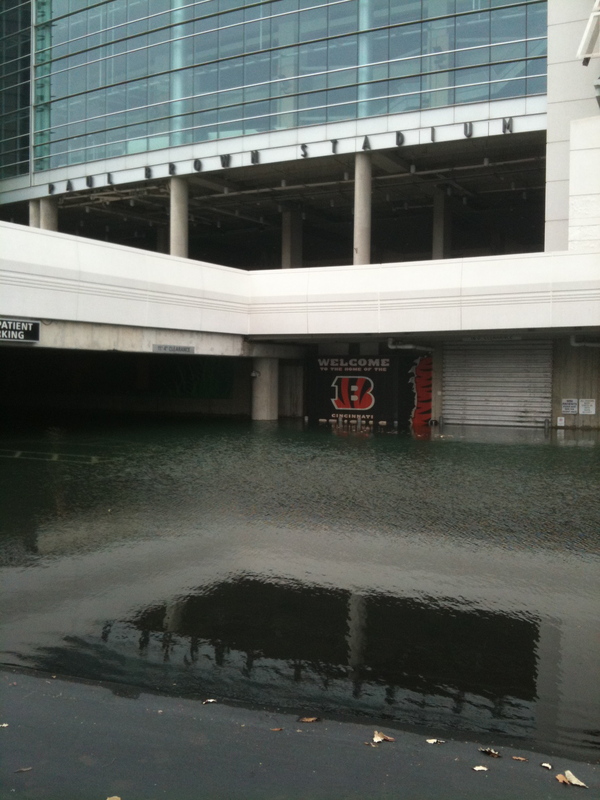 Above is an entrance to Paul Brown Stadium, home of the Cincinnati Bengals, underwater from Ohio River flooding. I took this picture last week. You can see the Bengal’s logo in the water. This picture is very fitting because the taxpayers of Hamilton County, Ohio remain underwater for one of the worst publicly-financed stadium deals ever. Despite the public subsidy, the Bengals lose year after year. I told you so. I voted no at the ballot box in 1997. I told anybody who would listen that the public subsidy for a stadium was wrong and that the Bengals were a bad outfit. I know it is not polite—But in this one case I just have to tell you that I told you so. After two weeks, it is time for me to leave Cincinnati. I’ll be returning to Houston in a standard manner. I’m going to get on an airplane and fly home. There are more showy ways to take your leave. 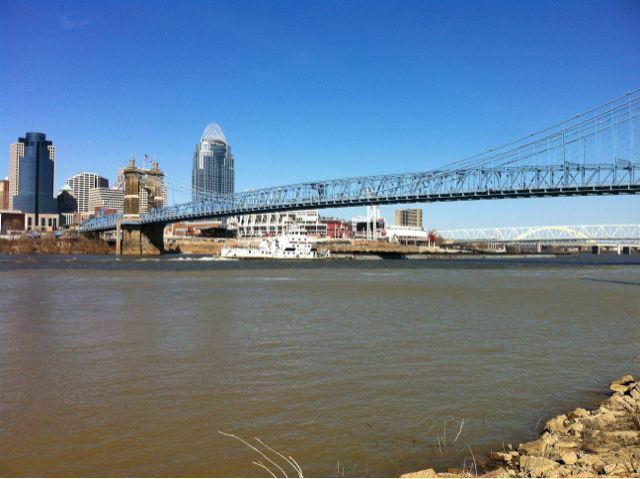 For example, above you see where The Waterfront restaurant had been moored on the Covington, Kentucky side of the Ohio River at Cincinnati. Last Friday night the place was unmoored by strong river currents. Many people were dining and working at The Waterfront at the time. The good news is that the barge the restaurant sits on did not float very far. Everybody was rescued and nobody was hurt. 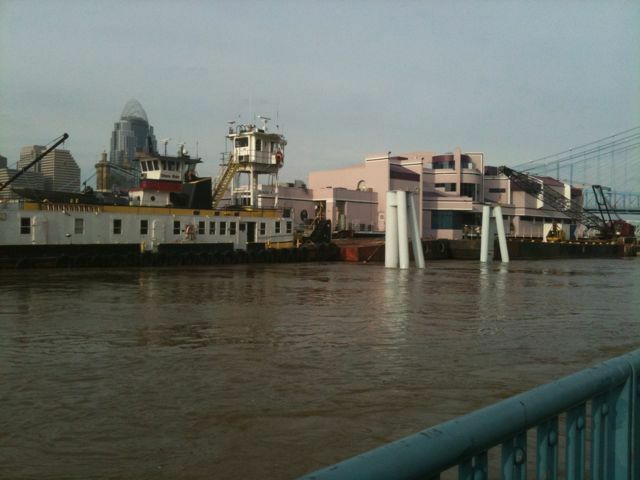 Below is a picture from last Sunday of the barge being pushed by tugs to another spot along the river. I’ll be making a much less noteworthy departure today. 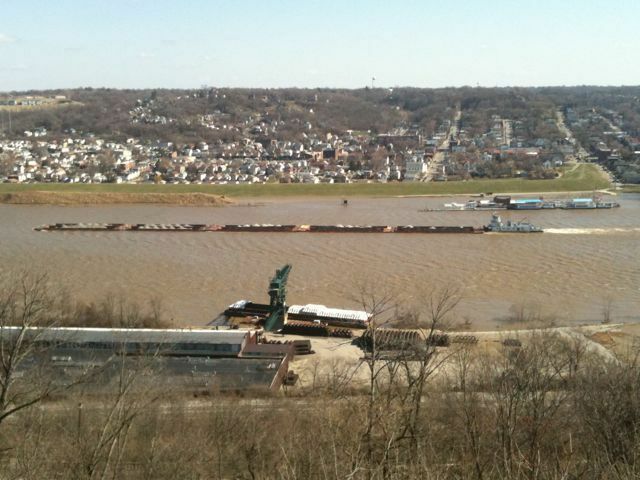 With this post is a picture of a barge laboring upstream on the Ohio River. I took this picture yesterday from the Eden Park overlook in Cincinnati. 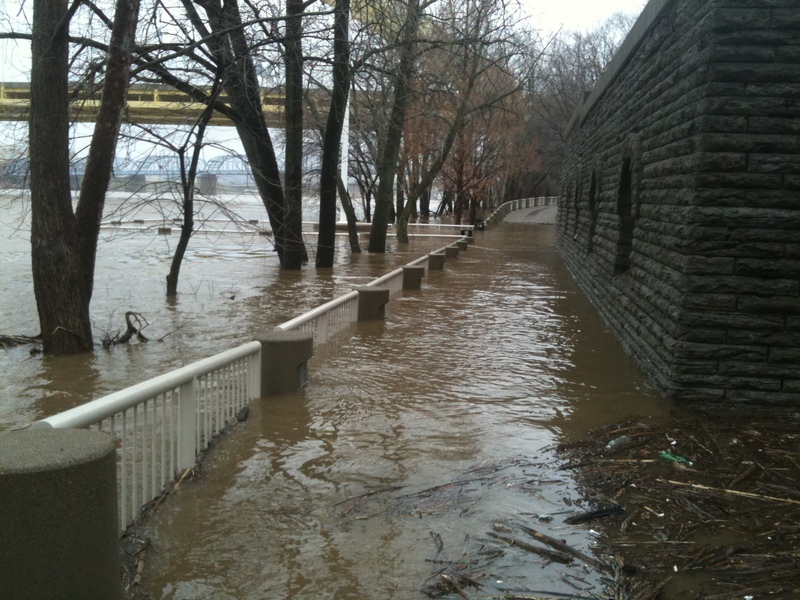 The river is a few feet above flood stage at the moment, and it is difficult for barges to go upstream. There are strong currents in the river. All of us are going upstream in one way or another. Without forgetting the role of circumstance in life, since it is beyond your powers to control a flooding river, and without forgetting that it takes a team of people to run a ship, you will simply have to press on against strong currents.